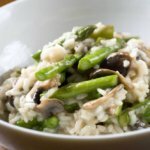 This creamy chicken risotto with asparagus takes a while to make (and involves a lot of stirring) but don't let that put you off, because it tastes wonderful. 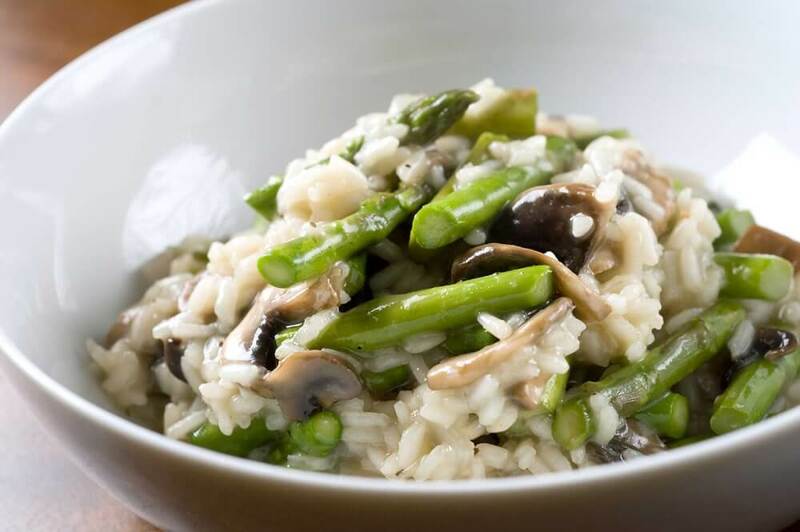 If you want, you can swap the asparagus for 100g of mushrooms and leave out the basil. Another variation is swapping the asparagus for baby spinach and adding a tablespoon of mustard when you're frying the bacon. To make this, you will fry the bacon, onion and garlic, then add chicken, rice and asparagus, as well as stock. Herbs, cream and cheese goes into the risotto just before serving. This makes a restaurant-quality Italian dinner. 1. Heat the oil in a big heavy pot over a moderate to high heat. 2. Add the bacon, onion and garlic. 3. Cook until the vegetables are tender and the bacon is golden. 4. Now add the chicken to the pot and toss until white but not yet golden. 5. Add all the rice and stir for a few minutes so it can soak up some of the oil. 6. Add the asparagus to the pot next. 7. Add about 1/5 of the chicken stock and stir. 8. When it has absorbed into the rice, add another 1/5. 9. Continue, adding some stock and letting it absorb, simmering gently, before adding more. 10. This will take about 30 minutes in all. 11. If the rice still isn't soft you can add another splash of stock and keep cooking until the rice is soft. 12. Take the pan off the heat. 13. Stir in the basil, parsley and cream. 14. Stir in the cheese and keep stirring until it's melted.